With Chinese New Year coming up, I went looking for interesting Chinese proverbs and I found this one. 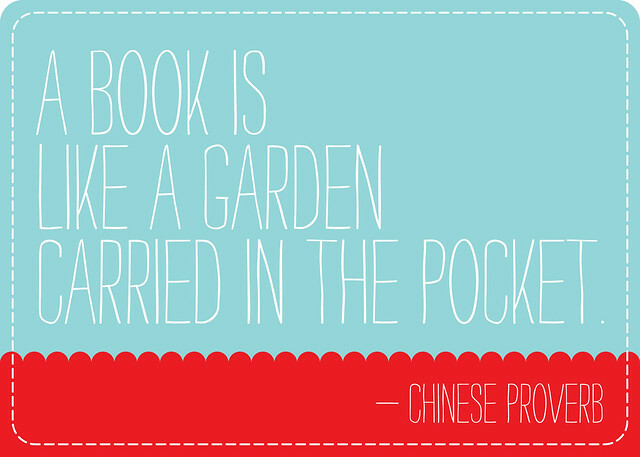 A book is like a garden carried in the pocket. How completely lovely! It's also rather timely for me, because I find myself in one of my starting a whole bunch of books phases. With any luck, I'll finish a few of them! One of the titles that I've recently started is Howard's End is on the Landing. I'm only at the very beginning, so I can't say too much of what I think, but so far it's easy to see that the author loves books. I mean really loves them. This proverb could have been written by her because she knows what a lovely thing books are. Sometimes it seems that I treasure books more than I'm able to read them, but I suppose it's similar to a garden. Times to plant, harvest, enjoy the beauty, and times to let the ground rest while you choose the next seeds to plant! I'm not certain which of those times I'm in right now, but here's my list of books in active progress: Wildwood, Dottie Angel, Little House in the Big Woods, Howard's End is on the Landing (plus others that I pick up here and there). Also, The History of the World in 100 Objects is sitting here waiting for me to start! What are you currently reading? Oh, and feel free to download and print the proverb image above. Just click it to take you to Flickr! Have you read the Little House books before or is this your first time? They are addicting once you start. These books are my all time favorite books! My next favorite is the Harry Potter series. J K Rowling has a amazing imagination; these books are hard to put down as well. I did marathon reads the nights the last three books were released and yes, I was at the stores in line at midnight to get them! If you haven't read Harry Potter, I highly recommend them. My next favorite series is The Earth's Children by Jean Auel. There is a lot of adult material in them so I don't recommend them to younger people. However, the heroine Ayla is great to read about and what life for her was like 10,000 years (?) ago is very interesting. One book that surprised me is about early American housing design and decorating. I currently don't remember the title. This book talks about faux finishes on furniture made in the early 1600 and 1700s. It also discusses period styles and how these different styles came about. Yes, I am a READER and I have more books than I have shelf space. If your stack shrinks then maybe you could try some of the books I have suggested here. I'm reading one called Olive Kitteridge, I'm just a 1/4 of the way into it, it seems good so far but a bit depressing. I like reading, but often don't allow myself the time. I'm trying to change that this year! I'm a bit of a bookworm, and I just loved the Little House books! Right now, I'm re-reading The Hunger Games-- it's one of my favorites! Oh, how is Wildwood?! I bought it last week and have placed in on my nightstand to begin reading it on Saturday morning with a cup of tea! Looking forward to it!